A mid-sized financial institution saved $100,000.00 in expenses when then used Trust Exchange to manage their third party risk. Trust Exchange provides a scalable cost effective way for Banks to automate Vendor Management. A mid-sized financial institution in the Midwest was struggling to manage its Third Party Risk. They were experiencing several key problems: lack of visibility through their organization, high cost of implementing a Vendor Management System and most significantly, high cost of maintaining and managing their Vendor Management Program. To top it all off they were getting pressure from the regulators to improve their program. 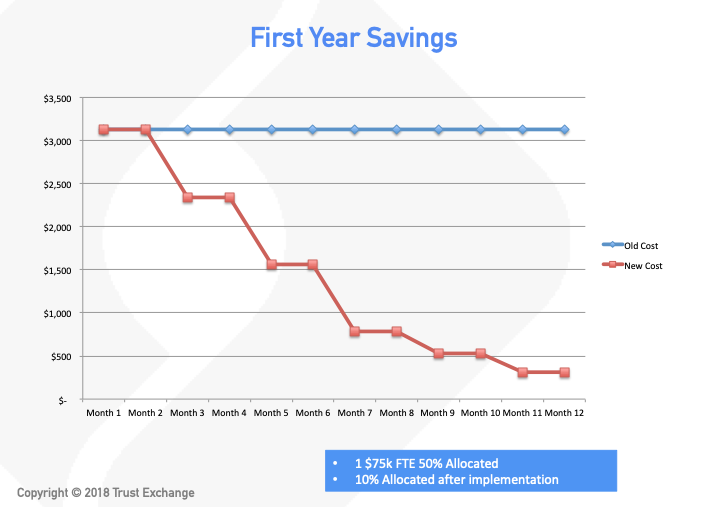 The Trust Exchange platform enabled them to consolidate the key information, dramatically reduce the costs of implementing and maintaining their program and increased their compliance readiness. They saved $20,000.00 almost immediately and $100,000.00 over the life of the agreement. The Trust Exchange Dashboard system enabled them to risk rank each vendor, create portfolios of vendors by type or risk level as well as create custom monitoring policies for each vendor type. This gave them increased visibility on each class of vendor, a real-time view into compliance performance and daily alerts on policy violations. The board level and management level reports ensured everyone was on the same page regarding vendor performance and compliance. Finally, through Trust Exchange, they were ready for an audit at any time. There was no rushing to assemble documents, reports or respond to auditors questions…it was already done and accessible at any time…in real-time. Prior to using Trust Exchange, this financial institution had a full time person earning approximately $75,000 annually dedicating at least 50% of their time to managing their Vendor Compliance program. This consisted mostly of managing documents, tracking down vendors, monitoring compliance and preparing reports for management, their board of directors and regulators. Over the first ninety days, they were able to reduce the management time by 80% and then by 90% by the end of the first year. Because Trust Exchange is a sort of “social network,” adding vendors to the database, critical events or reports is as simple as adding information on popular social media platforms. Typically, Trust Exchange can implement a mid-sized bank in about 45 days. Over the life of the contract, with about 50 vendors and one individual managing their program, they was able to save just under $100,000.00 in staffing expenses. The savings scales for larger financial institutions and networks. For example, over the past two years a network of financial institutions that had 40+ full time individuals cumulatively monitoring over 700 vendors, was able to save over $1,000,000.00 in staffing costs alone.